Let me preface this review with a simple statement that may or may not be something you’ve considered: testing wireless networking devices is hard. I don’t mean that it’s difficult to come up with testing scenarios; rather, it’s difficult to get consistent results that I feel confident in publishing. When you think about how wireless networking works that may not be too surprising. It’s amazing how even minor differences in the testing environment—moving a laptop a few feet, changing the screen orientation, using a different laptop chassis or antennae, switching routers, the weather and humidity, whether one of my neighbors happens to be using their microwave or a cordless phone, where human bodies happen to be, and dozens of other variables—can and will affect performance between benchmark runs. This is not an indictment of the technology, but rather a disclaimer about the difficulties involved in getting representative performance results. At the end of the day, all of the laptops and wireless devices I’ve used in this article work, and some of them work better than others; however, while I’m confident with my overall conclusions, there’s no guarantee that devices will always perform as shown in this article. If you need some more detail on why that might be, I suggest you start with our recent look at the Apple Airport Extreme (and Time Capsule) routers. Bigfoot is looking to provide better wireless networking performance with their Killer Wireless-N line, but perhaps they should start by making a Killer-branded router instead. We’ll have more to say on this subject in the conclusion. With that out of the way, let’s discuss what Bigfoot brings to the table, specifically with their Killer 1102 part. Note that there is a faster Killer 1103 part now shipping with 3x3:3 MIMO support; we will try to get a sample for future testing, but for now we’ll confine our benchmarks to the 1102. The core hardware actually comes from a well-known wireless networking company, Atheros. The 1102 uses the AR9382 wireless chipset, but Bigfoot has added their own “special sauce” to improve performance. Just what goes into their sauce? It’s a combination of customized firmware and drivers, with Bigfoot’s own Killer Network Manager application to help set the priority of different applications and manage QoS (Quality of Service) among other things. The Bigfoot wireless cards aren’t at the same level of complexity as their earlier wired networking cards (which included additional hardware and a Linux-based OS to handle QoS, load balancing, etc. ), but as we will see shortly, the end result is indeed improved performance compared to competing networking solutions. As part of this review, Bigfoot shipped us several items so that we could provide the best overview of wireless networking performance. First off, there is of course a laptop equipped with the Killer Wireless-N 1102. This particular laptop comes from Mythlogic, a company that we haven’t personally reviewed in the past, but they’re one of several vendors shipping customized notebooks using Clevo (and potentially other) ODM whitebooks. 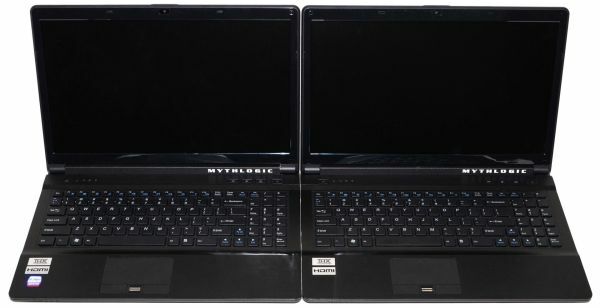 The Mythlogic laptop for this article is the Pollux 1400 (Clevo W150HR), loaded up with an i7-2720QM CPU, 8GB DDR3 memory, a 120GB Intel 510 SSD, and Optimus-enabled GeForce GT 555M graphics. This is essentially the Optimus version of the Clevo P150/P151 we’ve already reviewed with the Eurocom Racer and CyberPower Xplorer. Here are the specs of the Mythlogic notebook. As if one such notebook wasn’t enough, Bigfoot arranged to ship us an identical notebook, the only difference being the wireless networking card. One has Bigfoot’s new Killer Wireless-N 1102 while the other has Intel’s Advanced-N 6230 Bluetooth + WiFi card. Both cards are 2x2:2 MIMO devices, capable of connection speeds up to 300Mbps. While we’re on the subject, let’s clarify what the MIMO numbers mean. When we’re talking about a 2x2:2 part, the first digit is the number of transmit chains, the second is the total number of receive chains, and the third is the total number of data streams supported. It’s possible to have a 3x3:2 device, for example, which would use the extra transmit and receive chains to improve SNR (Signal to Noise Ratio), but the number of streams cannot be more than the larger of the transmit/receive chains (so 2x2:3 isn’t possible, but 2x3:3 is). Besides the laptops with their two wireless cards, Bigfoot also shipped us a Linksys E4200 wireless router (also known as the Cisco 4200), one of the few routers to support up to 3x3:3 MIMO, along with providing dual-band 2.4GHz or 5GHz support. There’s a catch with the 4200, however, in that it only supports 2x3:2 (maximum connection rates of 300Mbps) on 2.4GHz connections while the 5GHz connections offer the full 3x3:3 (450Mbps). Why have an extra receive chain if it’s not used on 2.4GHz? The reason is Maximal Ratio Combining, which as noted earlier can improve SNR. The Linksys E4200 is an important addition, as my own wireless router is a Netgear 3500L 2x2:2 solution that only supports 2.4GHz connections. With two different routers, one representing a “basic” wireless setup and the other being one of the fastest wireless routers available (Apple’s Airport Extreme actually wins out over the Linksys in many situations), we’re almost ready to begin testing. We’ve got Bigfoot’s 2x2:2 Killer 1102 and Intel’s equivalent 2x2:2 Advanced-N 6230 with identical laptops, but what about other competing wireless solutions? Rather than trying to swap out mini PCIe cards and deal with potential BIOS and compatibility issues, we decided we’d throw in a variety of other laptops with other wireless adapters. (Brian explained the issues with doing this on his Lenovo X300; other OEMs are generally more forgiving but there’s no guarantee, sadly.) In no particular order, we used the ASUS K53E (a second Intel 6230 solution), Acer 5551G (Atheros AR9283/AR5B93 2x2:2 2.4GHz), Dell E6410 (Intel Ultimate-N 6300 3x3:3 2.4/5GHz), Toshiba L645D (Realtek 8188CE 1x2:1 2.4GHz), and an Intel Sandy Bridge test notebook (Intel Wireless-N 1030 1x2:1,2 2.4GHz—this generally functions as a 1x2:1, as the second receive stream didn’t ever work in our testing). All of the laptops were equipped with SSDs for the testing, though in nearly all of the tests we are limited by network bandwidth rather than read/write performance on the SSDs. We also conducted wired networking tests using 100Mbit and Gigabit (on an Atheros GbE chipset), which we will look at later in the article. Before we get to the test results, there’s one more piece of equipment we used for testing: the “server” for files and other data connections. The test server has an i7-965 CPU, 12GB RAM, an Intel Gigabit Ethernet chip (on a Gigabyte motherboard), and it sports an OCZ Vertex 2 120GB SSD. We tested with jumbo frames disabled, which could potentially reduce CPU usage and increase throughput by a small amount if enabled, but for these tests the GbE networking performance shouldn’t pose a problem. With the test equipment out of the way, let’s discuss testing procedures. I'll put my $.02 in. Different cards have different drivers....each with their own defaul power settings. Unless all the various options are taken into account, it can be really hard to get a apples-2-apples comparison of power needs. But I agree to a point, the wi-fi power draw is really low compared to drive, memory, cpu, gpu, and LCD power needs. Kinda think of driving a car with the antenna up vs down.... yes it does make a difference, but not much. Just to post on this - Wireless being on or off can make a huge difference to battery life on notebooks - so some testing between cards could definitely be good. Eg on a Netbook I have (Asus n10jc), I typically get around 30 - 45min more battery life with wifi OFF. "While we’re on the subject, let’s clarify what the MIMO numbers mean. When we’re talking about a 2x2:2 part, the first digit is the number of transmit chains, the second is the total number of receive chains, and the third is the total number of data streams supported. It’s possible to have a 3x3:2 device, for example, which would use the extra transmit and receive chains to improve SNR (Signal to Noise Ratio), but the number of streams cannot be more than the larger of the transmit/receive chains (so 2x2:3 isn’t possible, but 2x3:3 is)."